Gerspach Sikoscow LLP is a litigation firm committed to defending medical professionals and the health care industry. Our 30 years of experience helping health care professionals and institutions at trial and beyond has cultivated a specialized knowledge of what works. However, just as medical knowledge evolves on a daily basis, Gerspach Sikoscow LLP does as well. We utilize zealous and innovative litigation tactics to effectively and efficiently resolve complex medical-legal controversies. We have an impressive record of success at trial, mediation and in negotiation. However, equally as important, we have been able to maintain long-term relationships with our clients because we provide personalized attention to every case. These tenets are what our firm was founded upon and what we believe will ensure its continued success. 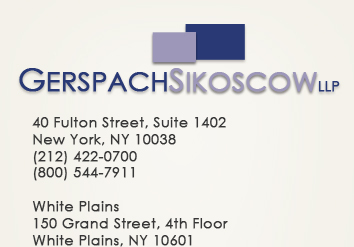 Gerspach Sikoscow LLP is a paperless law firm with advanced information technology. This enables us to confidentially provide our clients with internet access to documents concerning their case to ensure efficient and effective representation. Our offices are located in both New York City and White Plains, NY for the convenience of our clients.